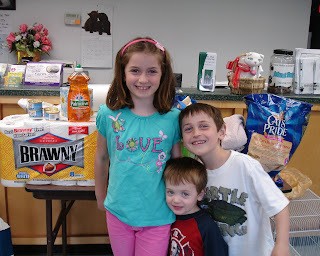 Medfield Animal Shelter News: Another Generous Birthday Girl! When Macey turned 9 years old, she selflessly asked friends and family members to bring a gift for homeless animals to her birthday party rather than a gift for her. Macey is shown here with her younger brothers Luigi and Marco. We are so encouraged by the kindness and generosity of young children like Macey and we can only hope that these children will someday live in a time where NO MORE HOMELESS PETS is a reality. How did Macey get to know about the Medfield Animal Shelter? She did a great deal of research on caring for guinea pigs and when Steven the guinea pig's family tired of caring for him and surrendered him to the shelter, Macey (and her family) was kind enough to adopt Steven.